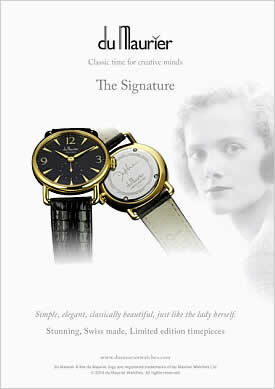 The idea for Du Maurier Watches was conceived by Ned and Marianna du Maurier Browning. Their company designs and produces luxury Swiss-made watches, which are all inspired by generations of the du Maurier family and their achievements. Ned’s ancestry includes George du Maurier, the famous Punch illustrator and author of Peter Ibbetson, Trilby and The Martian; Guy du Maurier, military officer and playwright; the matinée idol and actor-manager Gerald du Maurier; the Llewelyn Davies family which has become part of literary history as the Darling family in Peter Pan; Frederick Browning, Olympian, military officer and aide to the Royal Family and, of course, Ned’s grandmother Daphne du Maurier. The first watches in the collection took inspiration from Daphne’s most famous novel Rebecca, the ladies’ watch being the Rebecca and the gentlemen’s being the Maxim. These have been followed by the Daphne Signature for ladies and the Commodore for men. All the watches are beautifully designed and made using only the finest materials, including rose gold, diamonds and sapphire glass.